Slow down…with all the speed bumps! Speed bumps, speed humps, speed pillows, speed tables…whatever name they go by, they’re popping up all over Chicago! As a resident of a healthy Chicago neighborhood, it’s easy to see how their use has become, to say the least, rampant. The point of this article is NOT to dispute the applicability of whether or not speed bumps/humps/pillows/tables is justified from a technical standpoint. Rather, it is simply to present one resident’s experiences now that they are becoming commonplace throughout Chicago. Technically, speed bumps, humps, pillows, and tables are all slightly different and have varying applications. For the purposes of this article, I’m lumping them all together as techniques used to slow on-street traffic through changes in pavement elevation. Speed bumps have their inherent pros (ability to slow traffic, low installation cost, etc.) and cons (potential vehicular damage, difficulty for plowing and street cleaning, impact on emergency responsiveness, etc.). Again, the point of this article is NOT to dispute rather or not they should be used, but rather to point out curiosities about how they’ve been applied from the perspective of a resident. The typical residential block in Chicago is 600’ long by 300’ wide, with an alley that runs parallel to the long dimension. Generally, neighborhoods utilize alleys for garage access and have on-street parking lining the block. While some streets remain two-way (especially those on ¼-mile spacing), several local streets are one-way. As a result, the general condition is to have a residential street with a curb-to-curb dimension of about 30’ with one traffic land and two on-street parking lanes. This combination (no on-street curb cuts, one-way traffic, and relatively wide traffic lanes (usually about 14’) has led to instances of motorists travelling faster than appropriate for the residential density and level of pedestrian activity in most neighborhoods. In 2012, the City of Chicago unveiled its Pedestrian Plan that identifies a number of potential solutions for traffic calming. The traffic-calming toolbox is comprehensive, with speed bumps, humps, and tables included, but also identifying neighborhood traffic circles, alignment offsets, bumpouts, and other techniques for calming traffic and enhancing pedestrian safety. Since the adoption of the Pedestrian Plan, speed bumps, humps and tables have popped up all over the city, likely due to their low cost related to other types of improvements. In most cases, speed bumps are installed in response to a petition submitted by residents to the local Alderman. Curiosity #1: Must they be so frequent? In many cases, such as the instance shown on the illustration below, speed bumps are located so close together that they reduce the vehicle to idle speed. As a test, I tried to see how fast I could go after crossing the first speed bump before having to rapidly slow down for the second one. (The speed bumps are located approximately 150’ apart.) The result…15 MPH! Keep in mind, that’s gunning it with the intent of going faster than most cars would. While the intent is certainly to force vehicles to travel at a safe speed, the spacing of the speed bumps seems excessively close together. Curiosity #2: Why are they located so close to signed intersections? Most of Chicago’s residential street intersections are controlled by 4-way stop signs. Despite the spacing of stop signs every 600’ or 300’, some speed bumps are located extremely close to intersections. 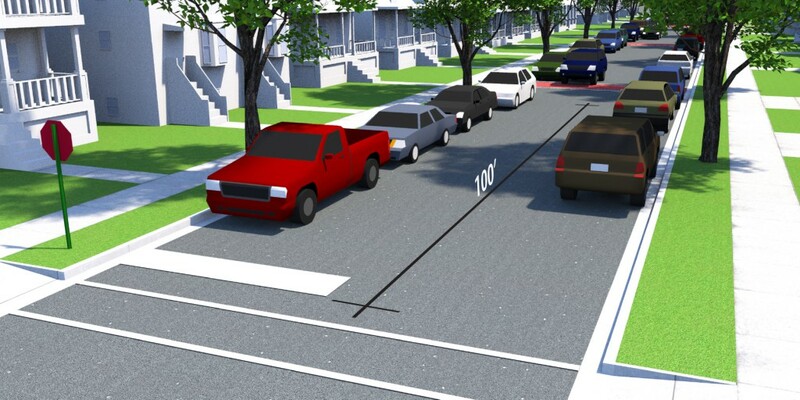 In the illustration below, the speed bump is approximately 100’ – that’s length of 5 parking spaces – away from an intersection controlled by a stop sign. The dimension of the block and the stop sign preclude drivers from travelling too fast, yet there is a speed bump located where motorists would be slowing down anyway. Curiosity #3: Must they be designed to do damage to a vehicle? Speed bumps get people to slow down because motorists don’t want to damage their vehicles. But they shouldn’t be designed to cause damage when the motorist behaves properly. There are several speed bumps – especially in Chicago’s alleys – that are so drastic that they cause jarring movements even when crossed at idle speed. This application demonstrates the fact that, in many cases, their application is not in-line with the intent. To reiterate, I’m not suggesting that the City of Chicago and other communities abandon the use of speed bumps. I am a firm believer that pedestrian safety should be the priority, especially in urban areas that support transit ridership, local commercial districts, and neighborhood schools and amenities. Rather, I’m suggesting that it is important for planners, engineers, elected officials, and others to assess a problem and develop appropriate solutions that actually address the issue at hand. In my opinion, the use of speed bumps in Chicago has become a low-cost solution to a problem that a) may or may not exist, and 2) may call for a different solution. There are many myths that surround urban planning. Some are about the profession in general: planning is slow, costly, and unnecessary. Others are in regard to specific projects and planning areas: density, transportation, parks, parking, etc. As planners, we try to educate the public through a robust public outreach and participation process. However, sometimes all the technical and educational expertise, cited studies, and years of experience do little to sway many planning myths. The basic human instinct to follow patterns makes for passionate advocates when it may come to potential changes to those everyday patterns. Given this, I call for another approach: Mythbusters. Yes, the loveable duo on the Discovery Channel who debunk common myths through hand-on experiments. If they can settle the great debate of roundabout vs. 4-way stop, why should they stop there?! Adam and Jamie and their explosive, pyrotechnic team should tackle every planning myth out there! Go to any Village Board or City Council meeting and pose the simple question – “What are the top three things this community needs?” Along with “more parking in the downtown” chances are one of the top answers will be “economic development”. Simple enough – but what is it exactly? More stores and restaurants? Sounds good. More jobs? That would be nice. How about infrastructure repairs and improved storm-water management? No? The reality is that economic development is a culmination of many different things including issues that are seemingly unrelated. An area that is prone to flooding and sewer backups every time it rains probably will not see the same level of investment as other areas. A business may leave town if the street and sidewalk outside of their building is in constant disrepair. Even the personalities and demeanor of officials and staff has an impact on economic development. A surly planner and a micromanaging plan commission can be a deterrent to anyone looking to develop or invest in a community. The reality is that nobody “does economic development”. Economic development isn’t a verb or activity. It isn’t just in the job description of an Economic Development Director who goes to ICSC or tries to extol the virtues of their town to the site selection people for Applebee’s. It needs to be on the minds of every department head, staff person, and elected and appointed officials. That international firm with five thousand employees may have just chosen your town because the street-sweeper happened to come down the block just before their visit. That’s economic development. Over the course of the last 20 years, the Randall Road Corridor has blossomed into a regional commercial center on the west side of the Chicago Region, with almost every national retailer present along the corridor. The City of St. Charles was among the first to develop along Randall Road, in more recent years neighboring communities have followed suit. A review of the different development patterns along the corridor reveals a contrast between the development pattern in St. Charles, which can be characterized as piecemeal and uncoordinated and other communities which are better coordinated and connected. In St. Charles, interspersed parcels have varying depth (140’ to 1,100’) and width and there appears to be little coordination in its subdivision or long-range vision. With this development pattern it is difficult to establish consistent development typology or circulation patterns between lots. As a result, access to adjacent lots often requires use of Randall Road and cross access is almost non-existent. Bent Tree Drive functions as a parallel route east of Randall Road in Geneva, while Merchants Drive (a dedicate road within the commercial site) provides a parallel route on the west. Parcels in Geneva have a consistent depth with logical connections between lots and blocks. Though parcel depths vary from 225’ to 900’ in Batavia, parcels and sites are linked by continuous streets that provide easy access between developments and to surrounding residential areas. Several contiguous blocks can be accessed without using Randall Road. In South Elgin, development utilizes driving aisles and internal access streets that parallel Randall Road. Building frontage and setbacks are consistent, and there is ease of circulation between sites, despite variable patterns of buildings and parking areas along the corridor. I typically enjoy my commute to work. I have at a minimum 5 alternative modes of transportation that get me door to door under 45 minutes. I can take multiple CTA lines, a Metra train, a bus, or ride my bicycle. All of these modes of transportation incorporate my favorite and most common form of transportation, walking. Since “road rage” is a well known phenomenon for car travel, I wanted to shed some light on the ridiculous scenarios I see as a pedestrian. I don’t think “sidewalk rage” has gone mainstream yet but it does exist. Some scenarios are funny, some are scary to witness, and some are just plain annoying.This is the first blog entry that is part of a series. I will continue to add new, even more frustrating, ped-peeves throughout the year. Ped-Peeve #01 – Failed red-light charge. Intersections are where pedestrians and vehicles have the most direct conflict. If I sit at an intersection for five minutes, someone will always try to beat a red light, fail, and then block the intersection for vehicles in the travel lanes and pedestrians in the crosswalks. It astounds me how often it happens but I can’t make my three and a half block walk from my train to my office without seeing it at least once. Many communities are making it more and more difficult for vehicles to create these vehicular/pedestrian conflicts by installing red light cameras, crosswalk safety enhancements, and establishing pedestrian awareness programs. Ped-Peeve #02 – The run of the bicycles and scooters. This one should go without saying but every once in a while I feel like I’m in the “running of the bulls” as I am surrounded by bicyclist and scooterists who feel they have complete control over their surroundings (they don’t, on a sidewalk you have no idea what a pedestrian will do next). On a sidewalk, pedestrians should feel safe and separate from street traffic. They should not have to contend with fast moving, unpredictable wheeled modes of transportation. This is a reasonable request. In many places, bicyclists are not permitted to ride on the sidewalk. In my neighborhood we have an extensive bike route system, many with designated bike lanes where bicyclists are required to follow the laws of the road. Bicyclists expect pedestrians to stay out of their bike lanes, so they should return the favor and stay off the sidewalks. Ped-Peeve #03 – Umbrellas at large. No one likes walking in the rain on their way to work. Actually, I do but I know I am weird. Sensible people carry umbrellas. They carry those small, collapsible, use me five times umbrellas and I will break umbrellas. Then there’s that guy carrying an umbrella made for the strong winds of Pebble Beach Golf Club. This umbrella can take a class 5 hurricane with ease and it only takes up the entire sidewalk. I guess it’s a small sacrifice to make, but he’s not the one taking jabs to the eye as he carries his umbrella low enough to keep his shoe laces dry. I think the target umbrella diameter max’s out at just keeping your shoulders dry, everything is fair game for the rain. If you missed our crossword puzzle in the APA Illinois Chapter State Conference conference schedule, or if you're dying to find out if you got the right answers, check out the pictures below. I stumbled across this video on YouTube. It was too good not to post. I don't know the creator but I think any planner can empathize them. Enjoy.